Guess who’s back! The man who routinely hit 100 MPH on the radar gun as a starter last season is on his way back and is already up to 95 MPH following Tommy John surgery. Strasburg is apparently in mid-spring training mode, as far as his recovery. That puts him about a month and a half away from the Major Leagues assuming all goes well. That, of course, is a wide assumption considering how serious this injury was. Nonetheless, if you have the roster space and could use an arm for the playoff run, Strasburg could play a role this season. Once the ace of the New York Yankees, this Taiwan native enjoyed back-to-back 19-win seasons in 2006 and 2007. Injuries have since limited Wang to just 27 appearances. His last outing actually came more than two years ago on July 4, 2009. The 31-year old right-hander hopes that there is still something left in the tank. He is currently in the midst of a rehab start and Davey Johnson hinted that he is just a start away from joining the Major League club. Even in his prime, Wang’s value was limited because he pitches to contact, however, in the National League his ERA can dip to a respectable level so keep an eye on his progress. The top prospect in the Blue Jays system was supposed to make his Major League debut more than a month ago, but then an injury forced him to the bench. The Blue Jays have made it clear that they will take the cautious route with Lawrie, who is dominating at Las Vegas despite learning a new position (third base). Look for Lawrie to spend at least the next two weeks in the Minor Leagues. Some good news is that current third baseman Edwin Encarnacion has heated up over the last month, even though he is clearly a short-term solution. The Braves are very much in contention in spite of the awful play of Jason Heyward this season. For a second straight season the much-heralded prospect has dealt with some injuries, and it’s an ankle injury that has forced Heyward to miss out on the friendly confines of Coors Field. It’s been a power outage for Heyward this season, as his slugging is currently under .400. Before the panic sets in remember, this talent is just 21-years old. He is listed as day-to-day because of an ankle injury, but he is expected to play tonight. Chipper Jones has been plagued by injuries for what seems like a decade now. The 38-year old remains one of the better power options in the Braves lineup, even though the career .304 hitter has been a .260 hitter the last three seasons. Recovering from minor knee surgery, Jones is still a few weeks away from returning to the Braves lineup, but he has taken some live batting practice and believes he may be a bit ahead of schedule. The big question for Mets fans is whether we will ever see Jose Reyes, Carlos Beltran, and David Wright in the lineup together again. While Wright is enjoying a rehab stint, Carlos Beltran can be traded any day now. Wright is recovering from a stress fracture in his lower back. The 28-year old has been raking at Class-A, and has set this weekend as a possible return date. Such progress has not come to Ike Davis, the Mets young first baseman who appeared on his way to breakout season before injuring his ankle. While the New York tabloids have gone back and forth on rumors surrounding whether he will be shut down this season, Davis himself has said that if he does not make serious progress in the next three weeks, the season will be lost. The Mets have been thrilled with the play of replacements Daniel Murphy and Lucas Duda. In fact, when Wright does return it may make the most sense to alternate Murphy and Duda at first, while also playing Murphy a bit at second base. Maybe it doesn’t seem like Strasburg’s performance was a surprise – he did get his fair share of hype on the way up. That said, plenty of top prospects have flamed out, especially on the mound, so the fact that he came up and maintained his double-digit strikeout rate (12.18 K/9) was very impressive. Even better, his control held (2.25 BB/9), and he got balls on the ground (47.8%). When he was on the mound, everyone was watching, and for good reason. Now we have to wait until late 2011, most likely, as he recovers from Tommy John surgery. Maya did not live up to his somewhat lofty expectations. After dominating in his home country of Cuba and pitching well at the World Baseball Classic, Maya did not show the ability to harness his secondary stuff in the major leagues (3.81 BB/9). With the mediocre fastball that we profiled here late in the season, he’s also not showing the strikeout ability (4.15 K/9) he needs in order to succeed. As of now, he’s not really fantasy-relevant. On the surface, Zimmermann’s statistics don’t seem to argue that he’s a keeper. His 4.94 ERA and 1.32 WHIP were not great in his 31-inning return from Tommy John surgery last year. However, his control was still strong (2.9 BB/9, 2.87 BB/9 career), and he did strike out an above-average number of batters (7.84 K/9). The rest of the reason for optimism comes from projecting his minor league numbers, where he struck out 9.4 batters per nine innings for his career. He’s got the punch, the control, and he keeps the ball on the ground – he’s a great deep-league sleeper keeper. Hernandez seems to have a good stretch every year, but in 2010, that stretch lasted all season. No matter. Despite some improving numbers, it’s fair to say that the portly 35-year-old right-hander won’t put up another 3.66 ERA – if only because the last time he bettered that number, it was in an Expos uniform in 2004. He’s not a terrible real-life innings-eater, but as a guy who doesn’t strike people out (4.85 K/9 last year) and allows a lot of flyballs (39.3% groundballs last year), he’s not a good fantasy starter for 2011. 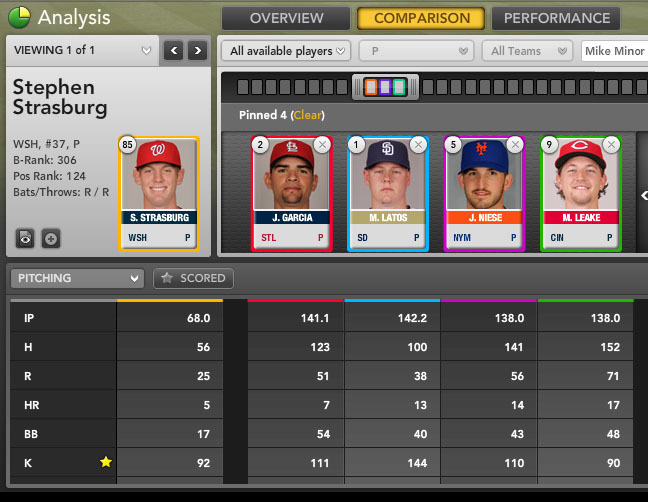 For more on Stephen Strasburg, Jordan Zimmermann and other young Washington Nationals, check out Bloomberg Sports’ Fantasy Tools. Many people are no doubt still mourning the loss of Stephen Strasburg as an exciting young pitcher this season and next. At some point, Strasburg will be back — and when he returns, hopefully he’ll perform as sharply as his teammate, Jordan Zimmermann, has pitched in the aftermath of Tommy John surgery. Zimmermann’s rookie season may not seem so special with a 4.64 ERA and a 1.36 WHIP. But before he went down with a torn ulnar collateral ligament in his elbow midway through the 2009 season, he was being mentioned as a top prospect in the Nationals rotation. That year, Zimmermann struck out a batter per inning and walked fewer than three batters per nine innings. His xFIP, a measure of ERA stripped of defense and bad luck, was an outstanding 3.39. Many forgot about him, thanks to the more than 12 months of recovery. But the evidence so far this season reaffirms the fact that Zimmermann is on the verge of becoming an excellent starter in fantasy leagues. On rehab, in 10 games in the minors this season, he posted a 1.59 ERA with 31 strikeouts to six walks in just under 40 innings. On August 26, he was recalled to the Nationals rotation to make his season debut. It was a little rocky with five earned runs allowed in just four innings — but he also struck out four and allowed a single walk. Zimmerman followed up that performance with an impressive nine-strikeout shutout of the Marlins on August 31. His last start was shakier: 4 IP, 4 BB, 2 K, 3 R, 3 H.
Zimmermann’s fastball is down a tick from 93 MPH last season to about 92 this season, but it’s not something to be especially concerned about, especially considering the small sample set. What’s especially encouraging is that the surgery and long lay-off hasn’t eroded his ability to get batters to swing and miss. His last start did raise some concern about controlling the strike zone, though. It’s possible that he goes into next season with a pair of seasons of 4+ ERA, a major surgery, and a lack of limelight due to his extended absence and last-place employer. But he’s an intriguing sleeper down the stretch of this season in deep leagues. And if you’re in a keeper league with some depth, he’s a must add. For more on sleepers down the stretch, check out Bloomberg Sports’ Fantasy Tools. The science surrounding young pitchers has never been set in stone. It’s come a long way since Rany Jazayerli first debuted Pitcher Abuse Points in 1998. The “discovery” that there was such a thing as too many pitches for a young pitcher then led to some new ways of thinking about young pitchers, pitch counts, and innings limits. Tom Verducci furthered the research with his own findings, called the Verducci Effect, that young starters that jumped more than 30 innings from year to year were more likely to end up injured. Of course it’s not really that easy to just slap the 30-inning-increase limit on a young starter, especially when a team is in contention and under to pressure to win now. Plus, more rigorous research has not found such a hard cap to be completely useful for all pitchers. All innings are not created equal. More advanced studies look into pitches per inning and what types of pitches are more responsible for arm stress than others. The soft cap that many use in baseball is about 125% of the previous year’s innings total, but that number is more of a general benchmark than one that has the power of multiple research findings behind it. The case of Stephen Strasburg offers a teaching moment. The upside of a pitcher like Strasburg made him a mid-round fantasy pick with the potential to return early-round value…provided he could put together enough major league innings. That was up for debate as his innings limits were reported to be around 140 to 150 IP – but no hard cap was reported in the media. Then this weekend, Strasburg grabbed his elbow and called the trainer to the mound, and his owners joined Nationals fans in a collective gasp. that young pitchers are less likely to amass critical innings in the latter half of the season. Whether from a cap or from injury, they are just more likely to have their rotation spot skipped late in the year, or to be shut down completely. Consider all the pitchers that have had the shutdown rumor associated into their name so far this year. Jaime Garcia, Mat Latos, Jonathon Niese, Mike Leake, Mike Minor and Strasburg himself have all been the object of innings-limits speculation from their front offices and the media alike. All of these men are good young pitchers that are vital to their fantasy teams. Jeremy Hellickson dominated in his first four big league starts. For his efforts, he got sent back to A-ball. The best-case scenario for fantasy owners the rest of this season is that he get recalled for a few September innings of middle relief. Garcia has 141.1 innings already, and his career high came in A-ball with 155 innings. He might be good for another 25 innings by that measure, but it’s complicated by his Tommy John surgery last year, and subsequent 33.2 innings pitched. His manager specifically said that the team was not going to limit its excellent young starter, but he also used 175 innings in his statement. With the Cards in the race (52% chance of making the playoffs according to Baseball Prospectus and their playoff odds), they’ll probably push the limit with Garcia. Latos, on the other hand, is on a Padres team that is 95% likely to make the postseason, and they’ll need him in October. At 142.2 IP, he’s already well past last year’s 123 IP total and just a couple starts away from a soft cap situation. Since the Padres are far enough ahead, expect to see his starts skipped often down the stretch. Minor, on a Braves team with a 92% chance of making the playoffs, has already had his starts skipped. His 138.1 innings so far this year are well beyond the 110.2 innings he accumulated at Vanderbilt in 2009. Leake and Niese are more likely to be shut down. Leake racked up 161 IP between Arizona State and the Arizona Fall League last year, but with his recent struggles the team demoted him to the bullpen at 138 innings anyway. The Mets have already openly contemplated shutting him down. They also have a 0.5% chance of making the playoffs, meaning there’s no point risking it with their young right-hander. Innings caps are no reason to avoid young pitchers altogether, but they do represent another risk that isn’t inherent with veteran pitchers. Next year, when it comes time to decide between two pitchers of similar ilk, it’s worth giving the veteran a slight nudge forward if late-year innings will be crucial for your team. And if you reach the All-Star break with a hot hand like Strasburg or Leake in your fantasy rotation, start aggressively shopping him for a trade. For more on Stephen Strasburg, Jaime Garcia, Mat Latos and other young pitchers, check out Bloomberg Sports’ Fantasy Tools. What Will We Witness from Washington’s Wunderkind? With all due respect to Brad Lincoln and Michael Stanton, the big debut of the week comes tonight in the form of Stephen Strasburg. His availability in most leagues is non-existent thanks to the hype and attention paid to his college and minor league performances alike over the last 12 plus months, yet it’s suffice to say most people who own 21-year-old have no idea what to expect from him except some variation of “good”. Let’s take a closer look through a pair of historical lenses at just what could be in store for Washington’s new ace. Since 1947 – the beginning of the expansion era – 97 21-year-old pitchers have thrown at least 100 innings while starting 80% of their appearances. Of them, Vida Blue is the only one to finish with an ERA below 2.00. 18 more finished with an ERA below 3.00; 47 finished with an ERA between 3.01 and 4.00; and five more finished with an ERA over 5.00. The average ERA is 3.62, which is pretty good, all things considered, but when we modernize the sample and make 1990 the furthest year back, that average ERA raises to a touch below 4.00 (with the best case scenario being Clayton Kershaw’s 2.79 ERA and the worst being Zack Grienke’s 5.8 ERA). Stripping away the guys who simply never made it or were relievers for most of their early career gives us a group of 20 arms. 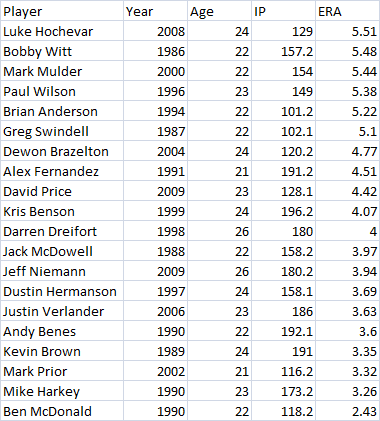 15 of which either posted ERA above 5 or below 4; or in other words: these guys are usually either above or below average. The average ERA is above 4 with the high water mark being just shy of 5.6 and the low being in the 2.3’s. If we slice the pool smaller, and focus on the really hyped top arms similar to Strasburg – like Prior, McDonald, Benes, Price, and Benson – then the average ERA hovers around 3.5. Using all of that information, we still have an incomplete picture from which to draw conclusions. One could argue that Strasburg is just another class of pitcher. One with more velocity, better control, a more polished feel for the game, and an enhanced sense of observation; you know, a lot of things that aren’t entirely quantifiable but sound good and intensifies the myth of Strasburg. Betting that Strasburg will be average or better is one thing; however do not fall into the trap of expecting a legendary performance from him. History simply isn’t on his side. For more attempts to profit off the prophets like Stephen Strasburg, check out Bloomberg Sports’ fantasy kits. 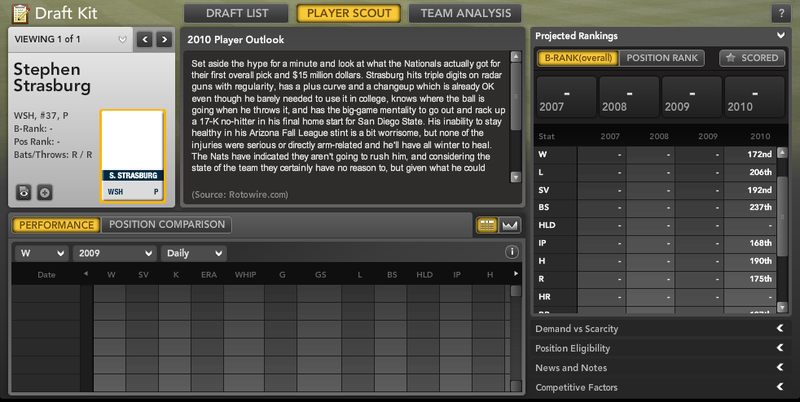 Let’s take a look at three much-hyped prospects and their potential to make fantasy impacts in 2010 and beyond. Worth noting: Since all three players aren’t sure bets to go north with their major league clubs (two are near shoo-ins for demotions), they do not own B-Ranks. The entire equation changes if the league is of the keeper variety though, so keep that in mind. Strasburg is being drafted 287th overall in non-keeper leagues, despite the Nationals’ stated intention to send him to the minors for mysterious reasons that allegedly have enough to do with money or service time and Strasburg’s lack of professional experience beyond the Arizona Fall League and spring training bullpen sessions. Bloomberg Sports still projects Strasburg projected to finish in the top 200 of wins, games started, innings pitched, walks, and strikeouts. An ERA projection over 6.00 is hard to take seriously, but again, the guy hasn’t thrown a pitch in minor league baseball, so anointing him as a fantasy stud this year is a reach. The lack of available data on him aside, Strasburg’s electric stuff and the Nationals’ desperate need to generate some excitement make his chances of seeing the majors at some point this year something like 95%. Strasburg’s division mate, Heyward could be an Atlanta Brave on Opening Day. The conservative projection for the Braves’ outfield has Melky Cabrera, Nate McLouth, and Matt Diaz starting, with Eric Hinske backing them up. None of those players are nearly as skilled as Heyward, and right field looks conveniently open for when the 20-year-old slugger ascends to the majors. Of the three vaunted prospects, Heyward seems the least likely to disappoint in 2010. Unlike Strasburg and Heyward, Jennings is not only far less likely to see much – if any – major league time this year, he also has no place on the big league club. The Rays have the immensely talented Carl Crawford and B.J. Upton playing left and center field respectively, and two extremely serviceable players in Matt Joyce and Gabe Kapler to platoon in right. Jennings finds himself in the same spot Joyce did last season, blocked because of a numbers game. A dazzling defender with great plate discipline and speed, Jennings has a history of injuries that could hold him back as well. If you’re looking for rookie outfield help this season, look to Heyward, or possibly the Florida Marlins’ Mike Stanton instead. Drafting prospects always carries risk, and these three cases are no different. As with any fantasy baseball decision, consider the value proposition. If your leaguemates fall victim to hype, don’t get into a bidding war for Strasburg, Heyward or Jennings. If all it will cost you is a late-round pick and a bench spot, Heyward and Strasburg are both worth a shot; Jennings too, if your league is deep enough. 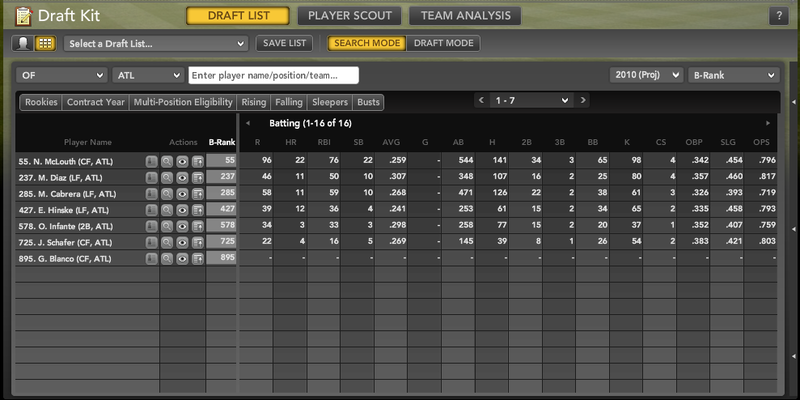 For more information on these prospects and hundreds of other players check out Bloomberg Sports’ fantasy kits.